The problem with Scotland’s press… in an American newspaper. The journalist Peter Geoghegan has written an excellent summary of some of the issues surrounding the press and the independence referendum. Its basic points are a lesson to people on both side of the debate and sum up much of what is problematic about the contemporary Scottish media scene. Man paid to write article setting out his true beliefs – shock! In the latest round of silly season frothing for the Holyrood bubble, the No campaign and others have gotten their knickers in a twist about this – an article written by Elliot Bulmer for the Herald. Their beef with it, apparently, is that the Yes campaign paid him for his time and didn’t say so. Except they did say so when asked. So here are some of the problems with this confected argument. 1. Mr Bulmer (pictured left, as I imagine him) has been writing about these same issues for years and making a consistent argument for a written Scottish constitution. The opinions he set out in that Herald article are the same as he set out in the Guardian earlier this year, in the Scotsman in 2011, and in a whole damn book he wrote in 2012. He’s not spouting a campaign line because he’s been paid to, nor does this piece appear to diverge at all from his earlier views. He’s being paid for his time because Yes thought it would be good for his views to get another outing in the media. And, apart from the slightly weaker interim constitution stuff in the article, I agree with them and him. No-one is being deceived – those are his views. He’s not Groucho Marx. 2. 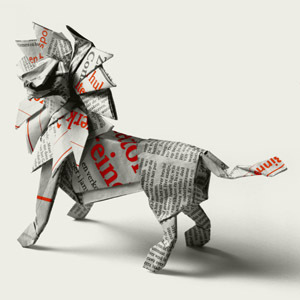 All sorts of articles in the media are written for money. I’ve done PR for years, and like everyone in PR, I’ve written articles which have been published in the papers, sometimes under my own name, sometimes drafted for a client. And even where I’ve just written a press release (for which I was paid), sometimes articles that get published bear a close resemblance to it without an attached notice explaining that “this cracking story was derived from a press release that James Mackenzie wrote for money and sent to us”. I really don’t believe any journalist who claims not to know that people regularly get paid by third parties to write articles that are then submitted for publication. And that applies to academics, staff at representative bodies, and (although we can call it hospitality or media passes or whatever) journalists too. Actually, that last one does bother me a bit. 3. Relatedly, articles in newspapers never show an audited trail of who got paid how much and by whom to get them to the page. Perhaps they should, but given they don’t normally, why is this one any different? Ah yes, because it’s about the partisan issue which both sides get overwrought about, desperate to pin anything at all on each other in case anything sticks. 4. 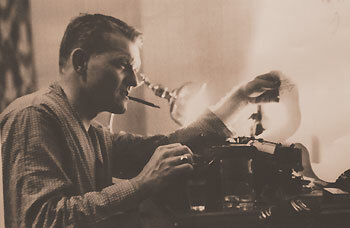 Writers should be paid for their work like everyone else. Journalists normally argue for this. If the Herald didn’t pay Mr Bulmer to set out his views this time, and Yes were prepared to do so, then that’s how some of his rent got paid that month. I’m glad to hear it. I despise the Huffington Post model which assumes writers don’t need to eat. It’s work like anything else, much as everyone likes seeing their views appearing in the media, and smart people should be paid for their time. 5. You can’t buy a respected academic’s opinions for £100, but you can buy an hour or two of his time. I got asked by a media friend if I would be equally relaxed about the nuclear industry paying an academic to write a pro-nuclear piece for the media. Yes – although I’d still disagree with them, but it’s only OK if it’s that academic’s actual opinion as previously expressed. And I bet you a five tier wedding cake to a stale digestive biscuit exactly that happens all the time, with the only difference being that whoever pays them doesn’t say “sure, of course we paid him/her” when asked about it. 6. Without wishing to sound paranoid, the only reason this story is going anywhere is because the emails that led to the Yes campaign being asked about it appear to have been accessed illegally by a third party. If those allegations are true, that’s a lot more serious, so you can see why the No campaign might want to go into a frenzy of bogus outrage about another issue to muddy the waters on that story. Cynically, it’s very professional diversionary media work, chaps. Well done. 7. This is the weakest attempt to find a scandal where there simply isn’t one in many years, and will have as much traction outside the bubble as a chihuahua in high heels trying to run on a perfectly polished sheet of glass. 8. My pieces on this blog express my views on all sorts of subjects, and I’ve not been paid for any of them, which is unfortunate for me. If anyone, literally anyone, wants to pay me an agreed sum to write a piece that’s 100% consistent with my views as previously set out here so I can see if any of the media will print it, drop me a line and I’ll tell you where to send the cheque. On the reporting of data. Good solid data is loved by the political and media classes, unless of course it points in the wrong direction. Then it’s an outlier, within the margin of error, set with an inappropriate baseline, or perhaps even the wrong thing to measure at all. But very little data is neutral, nor neutrally reported. Each sort tends to have a skew built into it, some of which are well worth analysing. House prices. 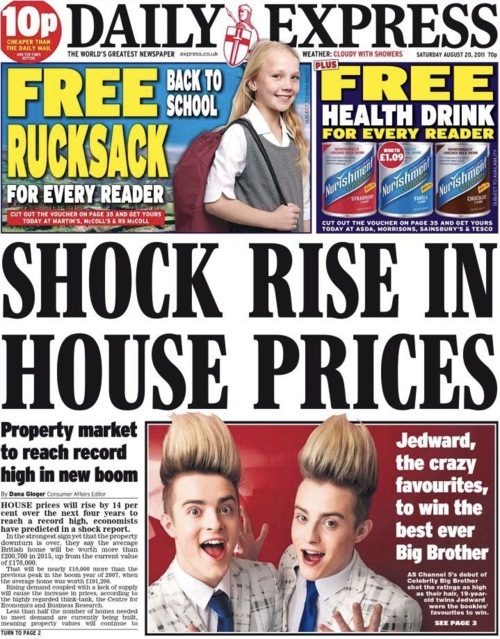 A rise in house prices is overwhelmingly regarded as a win by the media, not just the Daily Mail. And if you have a buy-to-let portfolio it is, or indeed if you’re planning to sell your house and run a beach bar in Goa for your retirement. If, however, you don’t own a home but would like to, or have a small home and need a larger one, it’s bad news. I don’t own a home, but maybe I’d like to at some point, so rises are bad news for me. I think they’re also bad news for the economy and society, too: they give to the haves and increase division. Inflation. Lower inflation is universally regarded as good news, which it is for pensioners on a fixed income, or people with substantial savings. But if you have substantial debts, they’re great. You want £10,000 back from me? Some inflation’s great, because the real value of that debt is now markedly lower. Hyperinflation along the Weimar model is clearly bad news, but for as long as we’re stuck with capitalism, very low inflation is certainly economically divisive. Unemployment. Insofar as jobless rates are still much reported on, and given the caveat that the official figures are only those people still tenacious enough to navigate a Kafka-esque benefits system, reductions are regarded as good news. Which I would agree they are, of course. But if you’re a rapacious big business in need of desperate jobseekers, moderately higher unemployment is in your interests. A rare example where the standard reporting frame doesn’t follow the class interests of the employers. Net immigration. All three parties who’ve run Westminster of late support bringing this number down, as part of their ultra-subtle Cosy Up To Farage strategy. I have entirely different concerns, including a desire to live in a more culturally diverse and economically successful country, and I see a decline in this rate as bad news. As the Telegraph itself put it, “because of immigration to the UK, British taxes are lower, spending is higher and the deficit is smaller. So, just for fun, let me ask the question again. Immigrants: don’t you just love ‘em?” Yes, yes I do. Stock market movements. More tangential for most people, but rises are always described as positive. Personally, I’d love to see shares in polluting industries collapse, but that may be a minority position. Still, the reporting is even weaker here. Back in the old days, when British interest rates were still allowed to vary, you’d regularly see “Interest rate cut boosts markets” in the media. Er, no. If you’re in the City, you’re looking for the best return for your clients, or more accurately for yourself. So if interest rates fall, the balance of profitability between shares and bonds/currency tips in favour of shares. So share prices go up. It doesn’t tell you anything about the real economy whatsoever. Anyone got any other glaring examples? I normally object to political hacks objecting to media bias. With the newspapers in particular, it always sounds like sailors complaining about the wind. But the BBC is a slightly special case. 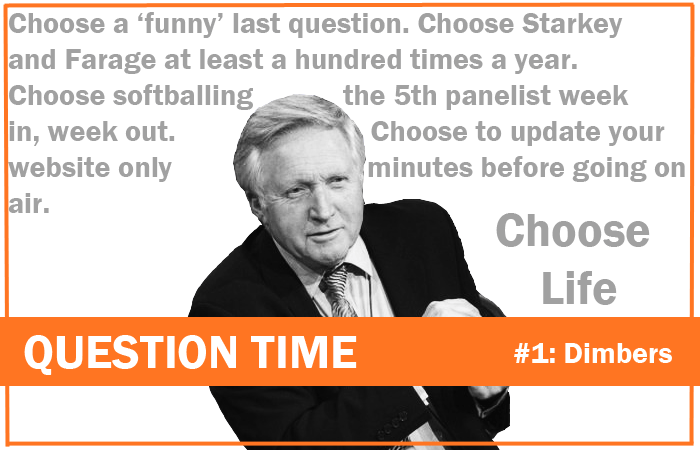 And Question Time is the most special case of all outside general election campaigns, because of its profile and because the balance is so easy to achieve. They don’t need every party on every panel, but over the piece the panellists they choose need to reflect the views of the public as reflected by their elected representatives. And that varies across the UK. Tonight’s Scottish episode is significant in two ways. It’s a week before a Holyrood by-election, and the audience will be entirely 16- and 17-year-olds, to reflect the fact that young people are being enfranchised for the first time in the independence referendum. Five parties are represented at Holyrood, and all five are standing in Aberdeen Donside, but there’s no Green on the panel. Instead we will have to tolerate both Nigel Farage and George Galloway again. Neither of them represent Scottish constituencies, and neither UKIP nor Respect have any elected representatives in Scotland. Both oppose Scottish independence, too. So, rather than a three-to-two balance in favour of the status quo, which would have been the politicians’ split if BBCQT even noticed actual Holyrood election results when considering balance, we’ll see a four-to-one split against, with just Angus Robertson the only politician speaking up for Scottish self-determination. The Lib Dems are also being excluded, which is a mistake too. Willie Rennie or another from his group – I’d like to see Liam McArthur get a crack, for instance – have a right to be there tonight just as much as Patrick Harvie or Alison Johnstone do. A panel of six, like they have planned already, would allow them all five actual Scottish parliamentary parties plus the only ray of light in this whole fiasco: the indomitable Lesley Riddoch. She’ll be brilliant and she’ll be feisty, and she’ll help make up for the problems with the panel. But that doesn’t make this good enough. BBCQT come to Scotland about three times a year, incidentally, and over the fourteen years since the first Holyrood election they’ve only once had a Scottish Green on: Patrick’s slot in 2011, even though Holyrood has always had Green MSPs. Do they really think Nigel Farage or George Galloway are more relevant in Scotland than the Greens? It’s perhaps time for the producers to admit they don’t give a stuff about fairness and balance on Question Time. They just want a rammy, so perhaps we should be grateful they didn’t put Nick Griffin and Melanie Phillips on. To exclude two sane voices in the independence debate (one from each side) in favour of two wild and unrepresentative demagogues, both on the same side on this issue: that’s bizarre. To exclude two of the Holyrood parties who are contesting next week’s by-election: that’s totally unacceptable. Let the official complaints begin. Update: you can complain here. Today’s Scotland on Sunday leads with “splits” in the Yes camp, revealing (shock!) that the SNP have different positions on the monarchy, the currency, NATO and so on to those held by Green and independent MSPs. Their editorial urges the SNP to ignore these fringe radicals, and what’s more, warns the radicals directly that they should shut up to avoid undermining the independence cause amongst “average” voters. Imagine making that kind argument about any other part of the political spectrum, that they should stop representing the agenda they got elected on because someone else decides it’s against their interests. They start with a misunderstanding, perhaps genuine, perhaps deliberate. Patrick Harvie, Jean Urquhart and Margo Macdonald aren’t trying to change SNP policy: it’s been decades since a drop of non-constitutional radicalism flowed in Salmond’s veins. They’re trying to emphasise that independence would put the power in the hands of Scots, not the SNP. The same edition of SoS features some deft polling carried out for the No camp. Punters were asked what will most influence their vote: the economy, tax & spend, pensions & welfare, health, currency, oil revenues, EU membership, defence, or education. It’s basically a few unavoidable “core” issues larded with areas where the No campaign feel they’ve hit Salmond hardest of late, but with the crucial issue not offered: whether Westminster or Holyrood makes the decisions that matter to Scots. That’s what independence means, it’s the most attractive aspect of what a yes vote would deliver, so perhaps no wonder the No campaign didn’t offer it as an option. Next, people were asked how convincing they find Salmond’s case for independence, and only 30% say “very” or “fairly”. It’s clever, because it sets two hurdles – not “do you back Salmond?” nor “are you convinced by the case for independence?”, but both. If I’d been asked that, I’d say “not very”, but I’m also definitely voting yes. Cunningly misleading polling, in short. The paper also notes that a quarter of SNP voters aren’t convinced by “Salmond’s case for independence”, and implies this is evidence against the radicals. But the dogs in the street know the SNP picked up support from committed No voters in 2011. These folk are primarily anti-Labour voters, they like the SNP’s top team as Ministers, they appreciate the party’s centre-right approach to tax and spend, and they’d undoubtedly support the Tories down south. Even if SNP invited every last one of them for a one-to-one with the First Minister between now and the referendum date, the benefit for the Yes campaign would be negligible. The SNP’s 2011 triumph was based on 44-45% of the vote, and that quarter Unionist/SNP estimate is consistent with the current polling on the referendum itself, as well as with that 30% figure above. The SNP’s specific case persuades about a third of the public, which is a great start. Specifically, it’s two thirds of what’s required for a majority, and these are not swing voters. They’re core SNP supporters – actual nationalists, unlike me – and they’re in the bag. Just a further sixth of the Scottish people will need to be persuaded if the referendum is to pass, or (to risk mathematical confusion) just one in four current No voters need to be won over. Whichever way you slice it, that feels like an entirely deliverable aim. But those extra voters needed for victory are definitely not amongst the group which voted SNP in 2011. There’s probably 6-7% or so amongst Green voters, the SSP’s remaining voters, and the disappointed ex-SSP voters who’ve not voted at all since 2003. There’s perhaps 1-2% to be found amongst the remaining Lib Dem voters. The occasional pro-indy Tory types are vocal but can probably be counted in the low hundreds at best. The rest, the bulk of the 17% or so required, will have to come either from Labour supporters or from those who don’t tend to vote at all. And it’ll be the Labour voters most disillusioned with Westminster, too, not the Blairites and the soft centre. The traditional working-class Labour voters for whom New Labour achieved nothing much after the minimum wage. Broadly, therefore, the winning coalition for the Yes campaign can only be the third of Scots who are committed nationalists plus the left-most sixth of the Scots public. I see no other way to win this. And that means letting a thousand flowers bloom about the post-independence possibilities. It means letting Scots hear that Patrick Harvie has an ambitious and radical plan for what an independent Scotland looks like, just as Alex Salmond has a far more cautious plan. It absolutely means making the most of Dennis Canavan and Mary Lockhart. Above all it means explaining that all these decisions – currency, NATO, the monarchy, tax rates, nuclear weapons etc – will be decided by Scots at the first election after a yes vote, and everything will be democratically on the table. Every time the SNP try to promote their own party policy as Yes Scotland policy, or more generally as a fait accompli if we win independence, they turn off that sixth of Scots who are essential to victory. This is directly counter to the SoS’s unhelpful advice. This, it should be borne in mind, comes from the paper which egged the SNP on to change its policy on NATO, something which won the party nothing but led to the departure from the SNP of two of those independent MSPs. And the same paper, in the same editorial today, explains that it’s formally against independence, preferring some unspecified version of devo-whatever. So they’re explicitly trying to achieve a different objective, they’ve misunderstood the current situation, and their solution would be both undemocratic and counterproductive. The SNP would be ill-advised to take any more advice on referendum tactics from the paper tigers of Holyrood Road.